Combine warm water and sugar. Stir until sugar dissolves. Sprinkle yeast over the water and let stand for 10-15 minutes, until it appears foamy. In the bowl of a stand mixer combine flour, salt and olive oil. Fit the dough hook attachment to the stand mixer and turn on low. Slowly add water, yeast and sugar mixture, then turn up the mixer one speed. Mix for 3 to 4 minutes until dough forms and is tacky but not sticky. 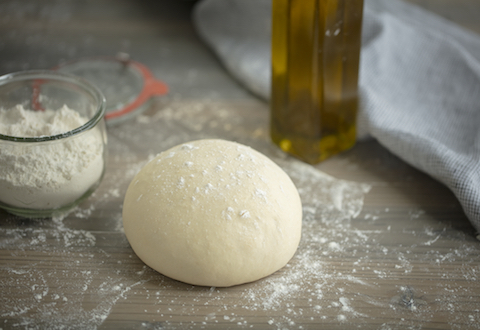 Turn dough out onto a lightly floured surface and form a round dough ball with your hands. Transfer dough to a lightly greased bowl, cover tightly with plastic wrap and allow dough to rise for 1 hour. The dough can be used now or stored for up to 48 hours in the refrigerator.